Taking place this week is NVIDIA’s annual developer conference, the GPU Technology Conference. A show for everything NVIDIA across all of the company’s major divisions, this year’s show stands to be especially important to NVIDIA. With their Pascal architecture set to launch this year, I expect we’ll be hearing more about it, and meanwhile tomorrow’s keynote is on the same day as the HTC Vive launch, underscoring the importance of VR. In fact it’s VR where we’ll start today, as NVIDIA’s professional visualization group is releasing some news a day ahead of tomorrow’s formal kickoff. NVIDIA is pitching products and technologies for both consumer and professional use, and today they are detailing their professional VR plans for the show. To kick things off, they are announcing a new notebook Quadro video card, the Quadro M5500. Much like its consumer counterpart, the GeForce GTX 980 for Notebooks, the Quadro M5500 is a new SKU for high-end desktop replacement style laptops that incorporates a fully enabled GM204, and an even higher TDP to support it. The significance of this new Quadro module – beyond now being the fastest mobile Quadro – is that it’s the only mobile Quadro fast enough to meet HTC and Oculus’s hardware recommendations, as the M5000M falls short. As a result this launch enables NVIDIA and their partners to sell VR-ready professional laptops alongside their existing consumer laptops. As far as technical specifications go, we are looking at a fully enabled GM204 GPU with a boost clock of roughly 1140MHz. The GPU is paired with 8GB of GDDR5, clocked at 6.6Gbps. Altogether this should be a major step up from the Quadro M5000M, which shipped with one-quarter of its GM204 GPU disabled. In terms of performance this means the new M5500 should offer a better than 40% performance boost in shader or texture-bound scenarios, along with 32% more memory bandwidth. The trade-off, of course, is that as performance approaches desktop levels, so have the power requirements The M5500 has a TDP specification of 150W, a full 50% higher than the 100W TDP of the M5000M. Consequently this is a video card for true desktop replacement style laptops, as it takes a very large cooling system to handle so much heat. The first laptop to ship with the M5500 will in turn be MSI’s WT72 mobile workstation, a 17.3”, 8.4lb laptop further paired up with Intel’s Mobile Xeon CPU. 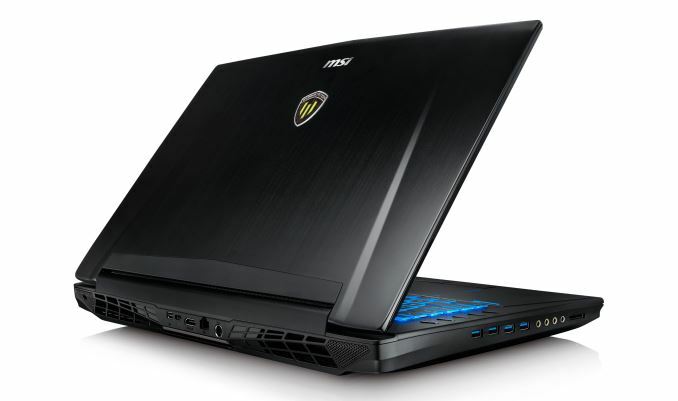 Meanwhile, though MSI’s specifications don’t specifically make note of it, I expect that the Quadro M5500 version of the laptop will not feature NVIDIA’s Optimus technology, as the card needs to be directly wired to the HDMI port in order to support VR headsets. Overall the Quadro M5500 will be the backbone of NVIDIA’s mobile VR efforts for this generation, as it stands alone in NVIDIA’s VR-capable mobile Quadro lineup. The company will be shipping the video card in May, and while a price has not been announced, expect it to be priced like a high-end professional mobile GPU. Along with the launch of the Quadro M5500, NVIDIA is also detailing their overall plans for VR support in the professional market. As with the consumer side of the company, the professional side sees VR as being a major engine of growth for the GPU business, as VR headsets require a very high minimum level of rendering performance. At the same time the company is looking to entice VR software developers with their VR toolsets. On the hardware side of matters, the company and its partners will be extending its VR Ready program into the professional desktop market. Dell, Lenovo, HP, and other vendors will be shipping VR Ready certified workstations in the coming months. 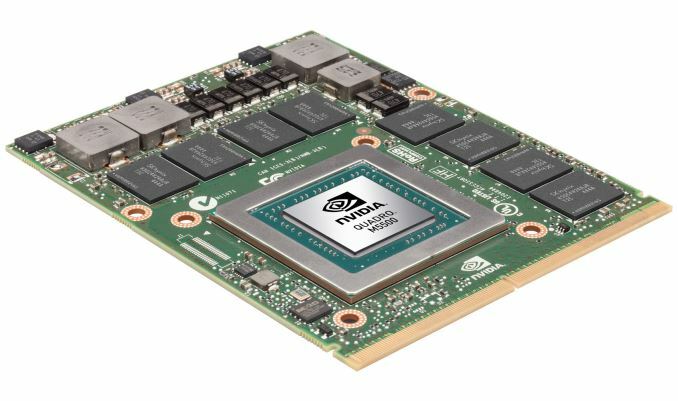 The minimum required here is the Quadro M5000 – NVIDIA’s second-tier desktop Quadro card featuring a fully enabled GM204 GPU – while various Quadro M6000 configurations will offer additional power. For those applications that support VR SLI, at the top of the stack is the recently launched 24GB M6000 in SLI. Along with the immediate performance requirements for driving a VR headset, NVIDIA is hoping to sell developers on the utility of additional performance when working on VR development, as content creation by its very nature lacks the rigid performance optimizations and boundaries of consumer content. Arguably the Holy Grail here is being able to do VR development in VR, and while current video card performance doesn’t quite allow that on a full scape, at least parts of the process can be done in VR today. At the same time it doesn’t look like we’ll see an NVIDIA answer to the recently announced AMD Radeon Pro Duo, however given NVIDIA’s dominant position in the professional GPU market, it’s not all that surprising. For professional VR, NVIDIA is also reminding developers that VR Works is available for professional applications as well as consumer applications. There are not any professional-specific VR technologies in VR Works, so the functionality is otherwise identical to what we’ve seen before, with application developers getting access to VR SLI, various shading techniques including multi-res shading, and support for asynchronous timewarp as implemented in the latest VR headset SDKs. As with consumer applications, for a lot of developers this will be more about what applications support these technologies, as they use licensed engines and applications to develop their final products. Finally, as far as professional VR use cases go, we should see quite a bit of it on display at the show this week. NVIDIA has a whole section of the showfloor dedicated to VR – what they’re calling VR Village – where developers will be showing off how they’re using VR. Common themes this year will include collaboration, medical, and prototyping/development (think VR CAD). Though VR as a whole has primarily been focused on consumer uses – and there will be plenty of that as the show as well – NVIDIA seem keen on showing professional users that VR can be used to augment what they do as well. Well my 880M GTXs (8GB each) bombed the VR test. So I guess it has a market. I wouldn't expect them to have one available quickly on a new process node. Besides, the market starts now and they don't want zero presence in the market for 6 months. "And do people really use those things on their laps?" Look on the bright side, if your spouse is technically savvy and she buys a laptop with a Quadro m5500 for you, it's safe to assume she's not interested in having (more) children with you.